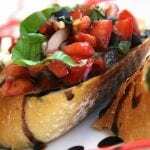 Classic Bruschetta with a flavorful twist. While balsamic is cooking wash and dice tomatoes into very small chunks. Add to a large glass mixing bowl. Peel and crush garlic. Dice olives into very small chunks. Add garlic and olives to tomatoes. Peel and dice onion into similar sized pieces as the tomatoes. Wash basil leaves and shake off excess water. Lay leaves on top of each other and roll into a tube. Cut into stripes, working in batches of about 7 leaves at a time. Add to tomato mixture. In a smaller mixing bowl measure olive oil and rapidly whisk measured balsamic to oil until emulsified. Salt and pepper to taste. Pour over tomato mixture. Stir and place in refrigerator while finishing Balsamic Reduction, preparing bread and dicing cheese. Dice cheese into very small pieces, similar to veggie sizes. Place in refrigerator until needed. Preheat oven to 350 degrees. Cut baguette in 1 inch pieces, cutting at an angle. Lay bread pieces on a cookie sheet and brush one side with oil. Bake for 10 mins or until lightly toasted. Let cool for about 10 mins. While bread is cooling, use a slotted spoon and drain a lg. spoonful of tomato mixture to remove extra liquid. Place 1 tbsp of drained tomato mixture on bread slices. Sprinkle with cheese and drizzle with Balsamic Reduction. You may want to buy two baguettes. The second loaf is perfect for soaking up the flavorful liquid.